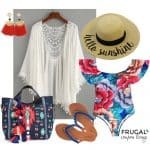 It’s another Frugal Fashion Friday and this time we are bringing a fun relaxed weekend loungewear outfit. 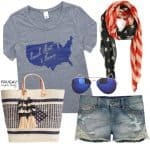 Clothing that is comfy, cute, and classic! I am pregnant with twins and I have a one year old. That being said, weekend loungewear is my typical Saturday and Sunday outfit (minus the time I get myself dressed for church!) We found comfortable loungewear for your relaxing weekend. Enjoy those days off! Don’t forget last week’s Frugal Fashion Friday Outfit, the Relaxed Boatneck Sweater Outfit – Pin It. It’s another Frugal Fashion Friday and this time we are bringing the fall color of spice and everything nice in this relaxed boatneck sweater outfit. I must be honest when it comes to this outfit. I paired it, all the peaces are trending, but it totally took me back to the 90s – yes, I know, let’s all catch our breath. From the mules, to the boatneck sweater, to the cropped pants, I know I have seen (and even worn) this look before. So I went with this Fall Trend of 2017 (no, not 1996) and did my best to fall in love with the 90s all over! I bring you a a Relaxed Boatneck Sweater Outfit with pulls from J.Crew, Nordstrom, and Ulta beauty – enjoy! 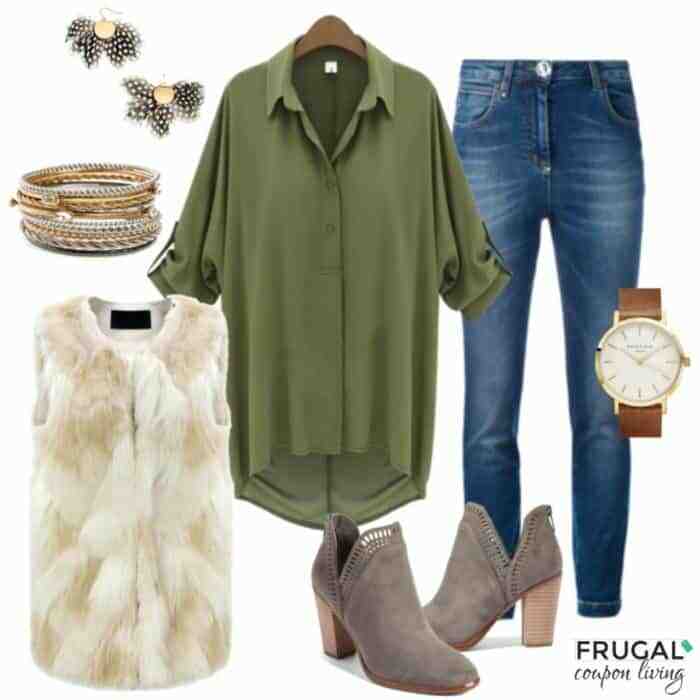 Don’t forget last week’s Frugal Fashion Friday Outfit, the Fur Vest Fall Fashion Outfit – Pin It. 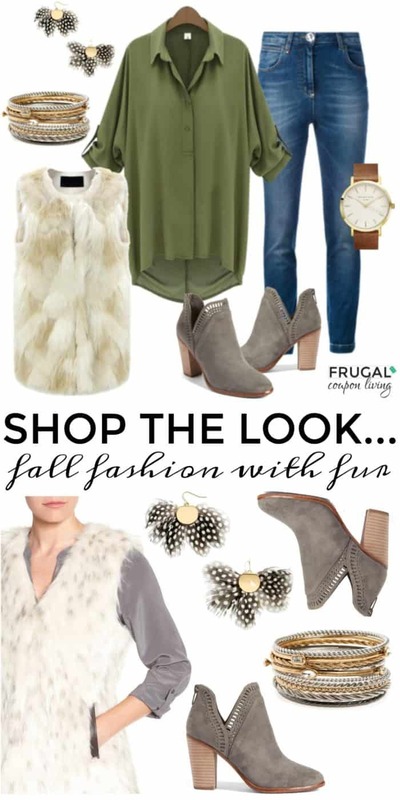 It’s another Frugal Fashion Friday and this week a faux fur vest to complete our fall fashion outfit. An olive green blouse, a cream vest, and feather earrings to the perfect classy fall look! It all centered around the pop of green from our loose and comfy blouse. We paired with a faux fur cream vest, some cut out booties, and popped with these adorable fun earrings – aren’t they cute. These bracelets remind us of David Yurman but are so cheap and affordable – don’t they look so cute?! Don’t forget last week’s Frugal Fashion Friday Outfit, the Apple Picking Fall Fashion Outfit – Pin It. 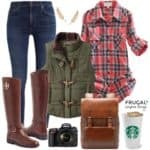 It’s another Frugal Fashion Friday, this week we want to take you outside with some fall fashion. This outfit is perfect for apple picking, hay rides, pumpkin patches and more! We are continuing the excitement of fall! This week we are ready to get outside! 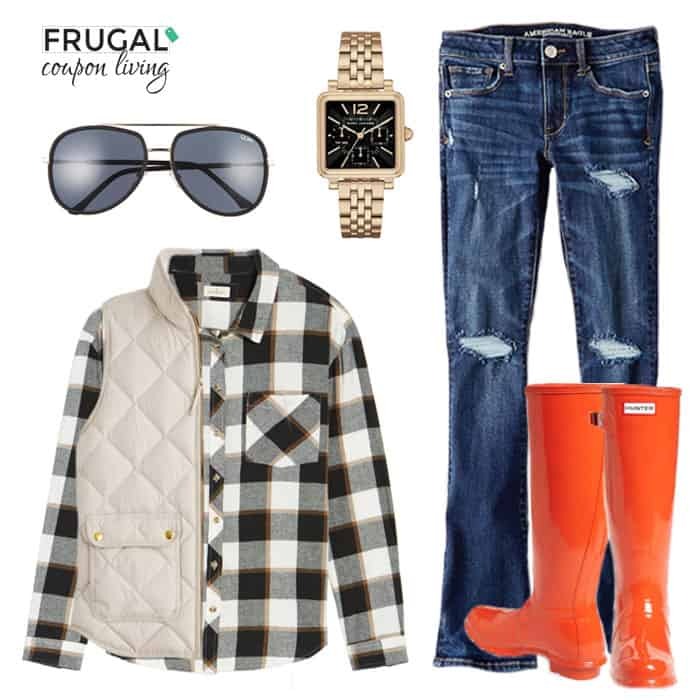 Pair flannel, a warm puffer vest, and some stand out wellies! Don’t forget the sunnies and a watch (if time really matters!) Take this fall look to the pumpkin patch, on your next hayride, to a October bonfire or apple picking! Don’t forget last week’s Frugal Fashion Friday Outfit, the Cranberry and Black Fall Fashion Outfit – Pin It. It’s another Frugal Fashion Friday, this week we are focusing on cooler weather and classy fall fashion with this Cranberry & Black Outfit. Perfect for apple picking, fall festivals, the pumpkin patch or even Thanksgiving dinner! Hello Fall… welcome. We found the perfect look for so many occasions. Apple picking, fall festivals, the pumpkin patch or even Thanksgiving dinner! Grab your summer chambray dress, pair with an oversized sweater, a felt hat and your favorite booties! We added a touch of accessories including this plaid scarf and druzy black earrings! Enjoy! Don’t forget last week’s Frugal Fashion Friday Outfit, the Pumpkin Patch Halloween Outfit – Pin It. Looking for some fall trending dresses for work & beyond? Amazon Fashion has you covered with a great selection of polished dresses starting at just $24! Choose from feminine lace frocks to pretty party dresses, or multi-colored maxis. You can find a dress for every occasion. 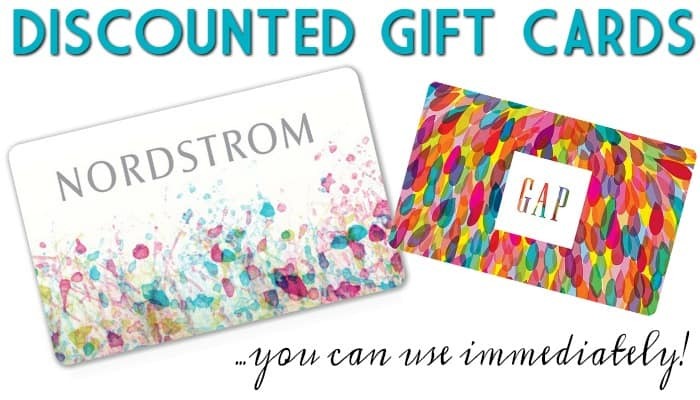 Don’t forget Amazon Fashion offers free returns on items sold directly by Amazon.com. It’s another Frugal Fashion Friday, this week we are focusing on cooler weather and October pumpkins with this Pumpkin Patch Halloween Outfit. Hello Fall… welcome. We found the perfect look for the pumpkin patch. Don’t forget your camera and coffee – those photos take work mama! 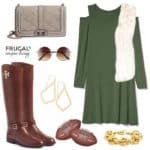 Don’t forget last week’s Frugal Fashion Friday Outfit, the Relaxed Halloween Outfit – Pin It. It’s another Frugal Fashion Friday, this week we are focusing on cooler weather and October holidays with this Relaxed Halloween Outfit. Hello Fall… welcome. Things we love about the Fall are holidays, orange, and of course some Pumpkin Spice! 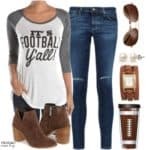 Don’t forget last week’s Frugal Fashion Friday Outfit, the Southern Tailgating Outfit – Pin It.